Its the best thing since sliced bread and its only $5.00. In tournaments, everyone knows that strategy changes depending on stack sizes. 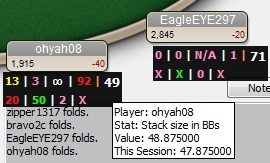 But each site shows you stack sizes as the total number of chips a player has. What is really important is the ratio of their stack size to the size of the blinds. Before I developed this statistic, I was always mentally dividing my stack size and my opponents stack size by the size of the blinds. Each Hand. Each Table. Each minute. It got old. What I wanted was to just look at the screen and see everyone's stack size so I could spend my time deciding strategy rather than wasting it working on simple division. It works on Windows and Macintosh. It also has been tested on multiple poker sites and networks. There are simple installation instructions with screen shots. Anyone should be able to install it. If you somehow have troubles anyway, I will be happy to provide tech support and troubleshooting. The direct download link, if you have already paid and have a name and password is here. BTW, you need to have a licensed (paid for) version of pokertracker. The trial version of pokertaker will not let you add this. This site uses Amazon Payments, so when you select the "Pay Now" button at the bottom of the page, you will be redirected to amazon's secure website where you can enter your payment information for the $5.00 payment. You can be confident your credit card information will be secure on their system. After you finish, you will be redirected back to this website to instantly download and install the new bb statistic.